Even if you haven’t become one of Glossier’s super-fans yet, you most likely have heard a friend talk about their products, seen their social media content, or read about the company being recognized for its innovation. Part of the allure of Glossier’s success is the mystery of it all – how did it grow such a huge (and loyal) consumer following so quickly? What does an upscale beauty brand do to attract 1.9 million Instagram followers, and counting, in less than 5 years on the market? A huge part of Glossier’s success comes back to one of the buzz terms of the moment – “brand authenticity”. Want to learn the secrets behind Glossier’s success on Insta? Curious how your business can mimic their tactics? Whether you’re a B2C brand like Glossier, or a B2B company, you can learn a lot from this company’s innovative social media marketing approach. Here are three things Glossier gets right with its Insta presence. A selfie, a meme, a cute animal video. Glossier did its research, and it knows that its target audience already has a feed filled with all these things. As such, the company gives its audience what it knows they like – in this case: pretty pictures of flowers, memes, cute animals, etc. – and these posts slip right in alongside their friends and another funny meme accounts. It’s worth noting that the vast majority of Glossier’s posts are product related, helping to build its brand, but it adds in additional snapshots of web trends, and ties them back into its brand. No, I’m not telling your HR software brand to forget everything and go post cute selfies every morning, but the approach highlights the importance of knowing your audience, picturing what their day-to-day social feed looks like, and working to conceptually and aesthetically blend in. Glossier walks, talks, and looks like what its customers want their own profiles to look like, adding to the “cool girl” allure of its overall branding approach. Color palettes are incredibly useful in branding – for example, DesignAdvisor says that 80% of brand recognition regularly comes from color impression alone. Glossier, in its approach, has essentially cornered the market on Millennial Pink and light grey, boosting brand recognition – as noted, many people would now know Glossier’s content from a posted image alone. Whether you’re marketing to the everyday consumer, or a corporate business, having a recognizable brand will help grow your credibility, and improve broader awareness and reputation. 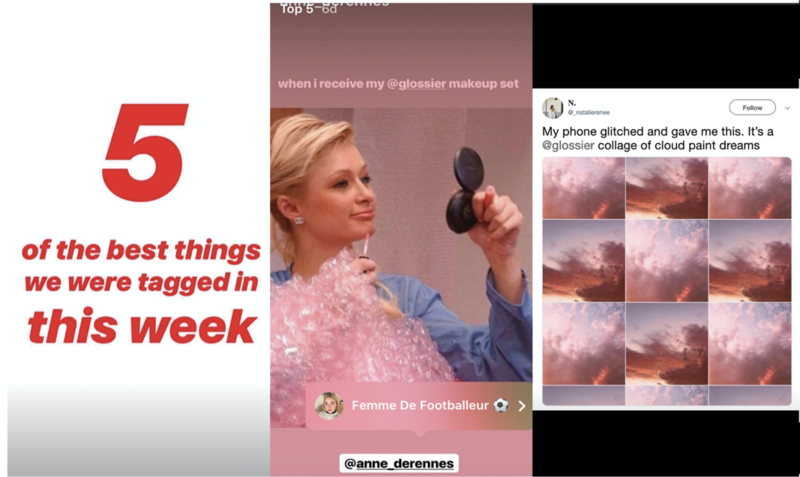 Take Glossier’s “Top 5” Instagram Story Highlight, for example – for this, the company finds five of the top posts it’s been tagged in for the week, then it posts each to its Stories feed and saves them into the specific Highlight on its profile. 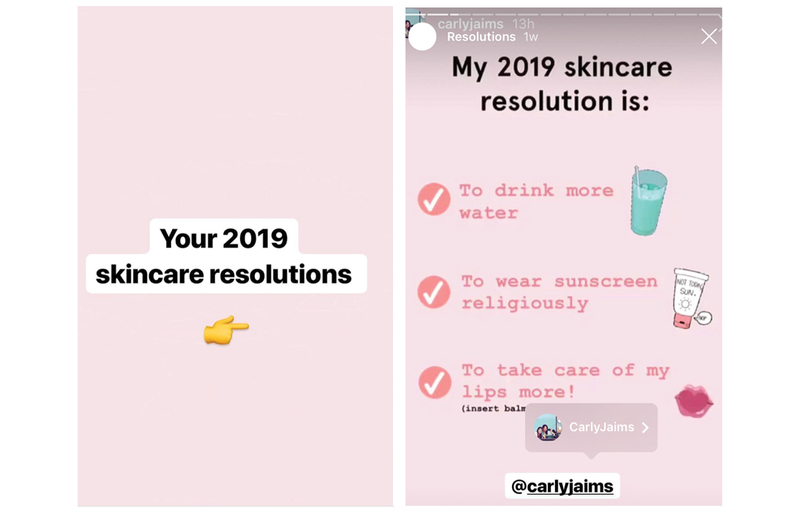 But they don’t stop at just that Highlight – Glossier also does the same thing with its seasonal “Resolutions” Highlight, connecting users through sharing their resolutions on Instagram. 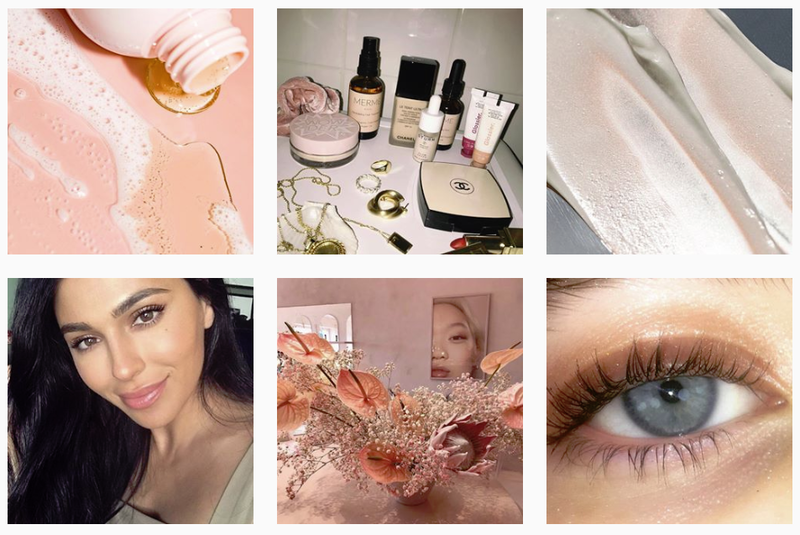 There’s a lot going on in Glossier’s Instagram feed, and a lot you can learn from how the company goes about engaging and connecting with its audience. But it clearly knows what its doing – Glossier has amassed a huge Instagram following, and continues to expand its community through consistent posts and community engagement.